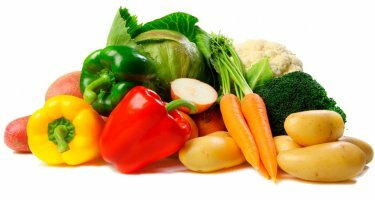 Eating vegetables provides health benefits - people who eat more vegetables and fruits as part of an overall healthy diet are likely to have a reduced risk of some chronic diseases. Vegetables provide nutrients vital for health and maintenance of your body. Vegetables are rich and comparatively cheaper source of vitamins so keep them in your daily supplies. You can easily shop for the needed vegetables here. We offer you the tasty fresh fruits and vegetables, vegetables high in vitamin c, protein rich vegetables, low glycemic vegetables, vegetable juice and more. Are you on a veg diet? You can make roasted vegetables or make a nutritious and healthy vegetable soup for your family. We can help you eat more fruits and vegetables supplying you the best exotic fruits and vegetables, best fruits and vegetables online! One of the main health benefits of vegetables is their high nutrient content. Vegetables are loaded with vitamins and minerals that contribute to growth and the maintenance of good health. Foods that are healthy will keep you strong, vegetables rich in protein and vegetables rich in calcium help stay in a good physical form, which is very important for modern people. Many vegetables are high in potassium, which is important for healthy blood pressure. Various vitamins, such as C and A, help keep eyes, skin, teeth and gums healthy, fight infection and promote wound healing. Perhaps most importantly, vegetables are rich in a particular group of nutrients called antioxidants, which fight cellular damage and help prevent heart disease, cancer, Parkinson's disease, atherosclerosis, heart attack and Alzheimer's disease. Vegetable vitamins can save you lots of money for the doctor's treatment and artificial vitamins supplements. Eating a diet rich in vegetables and fruits as part of an overall healthy diet may reduce risk for heart disease, including heart attack and stroke. Eating a diet rich in some vegetables and fruits as part of an overall healthy diet may protect against certain types of cancers. Buy vegetables online with Export Portal and stay always healthy! Find the best vegetable prices with us! Growing vegetables can be fun and effective way to stay healthy. Are you occupied with organic vegetable gardening and need the best vegetable seeds for sale to grow vegetables in your garden? We supply you with the winter vegetables to grow in a greenhouse, vegetable garden plants, vegetables to plant, vegetable plants for sale, seeds of the best vegetables to grow for healthy nourishment of your children. Buy vegetable plants online worldwide! Vegetables sellers and food products suppliers are also welcome to display their offers for vegetables for sale at Export Portal!